← Hello Goodbye Dog and Giveaway! Opening: This is Virginia Lee, but everyone in seaside Folly Cove simply calls her Jinnee. Anyone who meets Jinnee will tell you that she is quite magical. 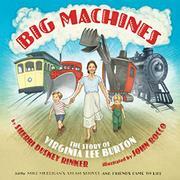 Virginia Lee Burton created much beloved, classic picture books starring the big machines that her sons, Aris and Michael, adored. From a steam shovel named Mary Anne to Katy the brave tractor, and Maybelle the cable car, Jinnee Burton wove endearing stories around the rumbling, chugging, heavy-hauling BIG equipment that fascinated her sons. Read Virginia Burton’s books! Here is a list of her HMH titles. Watch a movie! Preview a movie about Jinnee’s life in this trailer. 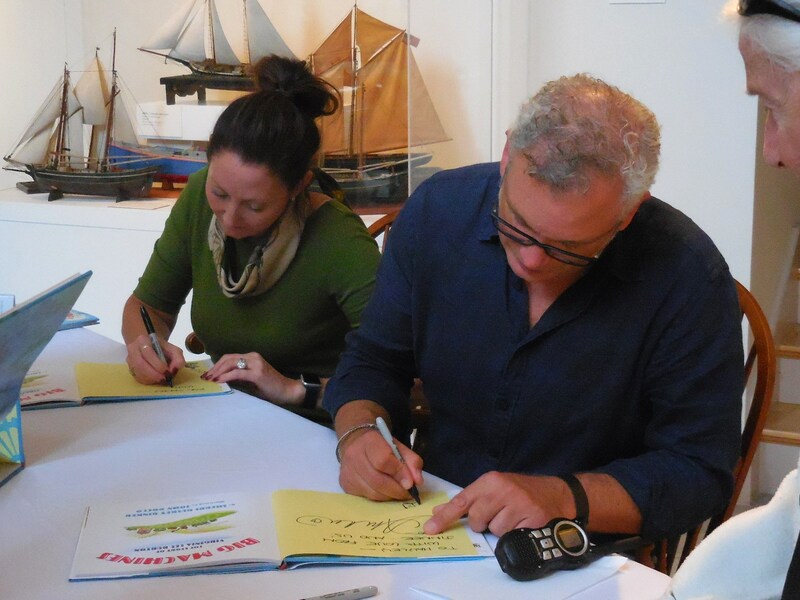 Visit Cape Ann Museum! Lots of Jinnee’s work is on display. I’ve been crazy about Jinnee Burton’s work since my first visit to the Cape Ann Museum in 2013. You may remember reading my blog post Follow Me to Folly Cove in which I gushed about seeing her books, tools and samples of her work on display. 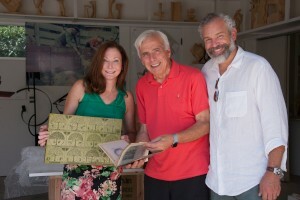 When I learned that Sherri Duskey Rinker and John Rocco were teaming up to create a tribute book about Jinnee in preparation for the 75th anniversary of the Caldecott-winning The Little House, I was really excited to see their work. In August, Publishers Weekly offered a sneak-peek into their collaboration. Sherri and John worked closely with members of Burton’s family, which including digging through the vast archives stored in her son’s garage! The Cape Ann Museum hosted one stop on the national tour for BIG MACHINES, an event I could not, would not miss. Sherri and John gave an engaging, entertaining presentation to an audience that knew, worked and lived with Jinnee in her heydays. Their loving tribute to Burton echoes throughout the book’s pages in carefully-chosen words, rhythm and iconic patterns of swirling, swooshing text and image pairings. For the adults who love Jinnee’s books and the new generation of young readers that will be introduced to them for the first time, BIG MACHINES is a big winner! 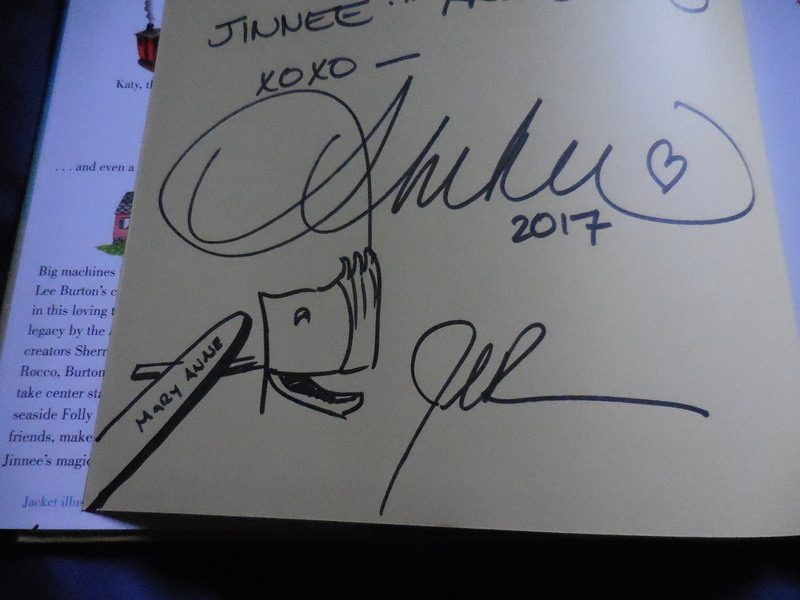 Sherri and John signed lots of books! Love my Mary Anne illo! This entry was posted in Uncategorized and tagged BIG MACHINES, Cape Ann Museum, John Rocco, Mike Mulligan and His Steam Shovel, Perfect Picture Book Friday, Sherri Duskey Rinker, Susanna Leonard Hill, The Little House, Virginia Lee Burton. Bookmark the permalink. Cathy, I hope this book garners the same acclaim as Jinnee’s original books. I do too! It is so interesting to compare the themes and imagery in all of her books. Sherri and John have done a wonderful job highlighting the best of the best in this book. I look forward to reading this book. I too am a big fan of Jinnee’s books. I hope you will enjoy re-visiting old book friends in the pages of BIG MACHINES Robin! Oh, how neat, Sherri wrote a PB Biography about a beloved author! Thanks for sharing. I hope to read it. So fitting, right? From GOODNIGHT GOODNIGHT CONSTRUCTION SITE and STEAM TRAIN DREAM TRAIN to BIG MACHINES – it all fits together perfectly! I hope you have a chance to read it too. Oh, how I loved to read her books to younger siblings and kids I babysat for. I am so glad this book is being written about her remarkable life. I think “The Little House” and “Mike Mulligan” were my favorites! I hope this book is a winner, like her book. If you pull out those old favorites you may realize how long they are by today’s standards, but the language is still so beautiful. Thanks for commenting and RT’ing Pat! So cool! My son LOVED her books. So we’ll have to read this book! Thanks for bringing it to our attention, Cathy! And now I’m wondering whether Hamline would be a possible repository of all that wonderful ephemera that’s sitting in her son’s garage…. Indeed! I don’t know where it will end up – it’s already moved from the East Coast to California once. But it would be wonderful to see it carefully curated and preserved. Hope you enjoy the book! Oh! I hadn’t heard a word about this one, but I can’t wait to read it! I wonder how many classic books were inspired by the children in people’s lives! I bet there are many! I hope you like it – the way the text is arranged on the page around the images is truly masterful. Beautiful book design, and well, John Rocco. I was able to put a hold on it! This book is new to me. It looks like a great one. I will check it out. Thanks for the review. Thanks for stopping by Rosi! I hope you enjoy the book and its gorgeous illustrations. Cathy, I loved her books as a kid, as did my kids, I haven’t seen this biography yet. I added it to my library list and am excited to read it. Thank you for highlighting it. She was such an interesting and dynamic artist, mother and woman! This lovely book is a long overdue tribute to Virginia and her work. I do hope you will enjoy it! Ooooh! I didn’t realize there was a picture book about her! I remember her books from my childhood. She’s such an interesting person, and a perfect fit for Sherri to write about given the topic! Thanks for stopping by Beth. This sounds like a very interesting book. Love the cover and hope it’s heading down our way. What a wonderful book to get both boys and girls interested in engineering at an early age! I hadn’t thought of it that way, but yes. I think many parents find that they learn lots of facts about their children’s passions, be it big machines, dinosaurs, soccer or ballet! Jinnee was certainly a passionate and caring mother, tuned in to what her sons liked. Thanks for stopping by Chris!